The Raptors picked up where they left off before the break and continued to show their effectiveness on the road, and picked up another road win. Kyle Lowry made his case on why he should have been an All-Star and outplayed Washington's John Wall in a 103-93 win on Tuesday night. 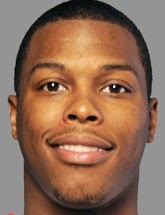 14 Toronto blew the game open in the third quarter where Kyle Lowry dropped 14 points on 6/8 shooting. 43 It was a solid performance for Toronto's bench, scoring a combined 43 points. 14 Amir scored 14 points on 6-8 shooting with 5 rebounds, a steal and a block in his return from his ankle injury. 57% Toronto shot the ball well on the night, shooting a blistering 57% from the field. 3 Washington have now lost three straight games and currently hold the sixth spot in the East. 22 First time NBA All-Star and "Dunker of the Night" John Wall led the Wizards with 22 points and 7 assists. 6:43 Washington made a run in the fourth and held Toronto to almost seven minutes without a field goal.